Has anyone noticed this irregularity with Facebook.com Referral Traffic? While preparing some month end reports we noticed inconsistencies within Referral traffic and Facebook.com in Google Analytics. Usually for all of our dealer clients, Facebook.com traffic ranks below any group, OEM or 3rd party site referrals, at least it was that way thru November 2018. Across all of our dealership client GA accounts, this is the same pattern - December & January Facebook.com traffic spiked up to be the number 1 referral source or number 2 (behind auto group sites). There is not a corresponding pattern of dates for the spike in traffic (see attached), however there is a pattern of locations based on where Facebook.com traffic is originating from;Los Angeles, (Not Set), Anaheim and San Francisco. Our clients are located in the Great Lakes and Midwest, so no reason to have FB referral traffic from these locations. Are you seeing the same in your Google Analytics account as we are? Carl Maeda and John Goll like this. We have noticed this as well and have been studying this increase for the last week or two but for most of our accounts, Facebook referral traffic is not the #1 referral source. However, its' in the top 5 where previously, it was much lower. Some of our accounts saw very large amounts of traffic while others saw smaller increases. When we examined the accounts to try to find the commonality between these accounts, we found that dealers who were purchasing Facebook Ads saw much larger increases. We're not sure if this has anything to do with the increase yet because the dealers in larger markets will buy Facebook Ads anyway. 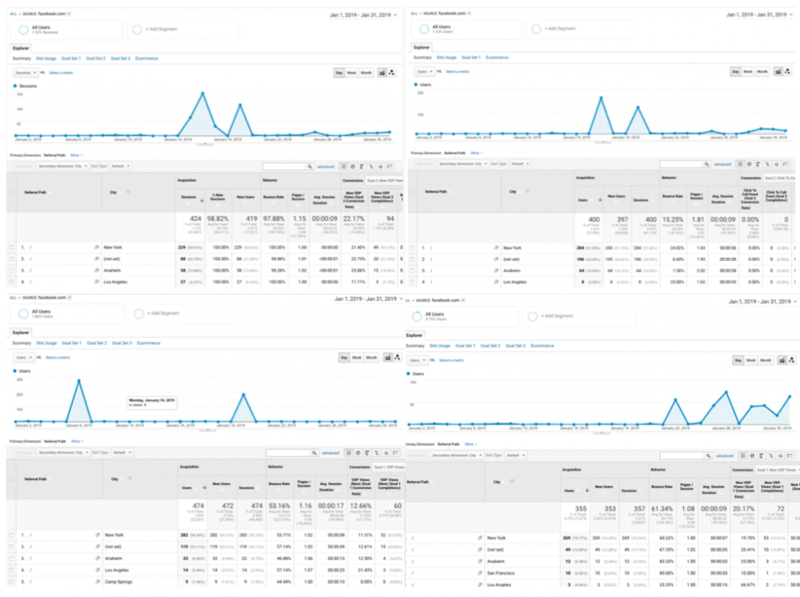 In addition, the traffic from Facebook suddenly dropped in quality - meaning the bounce rate, pages/session and session duration are all much worse. Most of the new traffic has a session duration of <10 seconds. Similar to you, we are seeing traffic from areas far from the dealership - most of the time from California and New York. Despite the low quality traffic, the traffic does appear to be legitimate. If its' a bot, its' a very good bot. The ISP looks pretty random, the browser used is a mix of Safari, Android, Chrome, etc. The one factor that seems off is that the majority of new users are desktop users. We have not drawn any conclusions yet but I wanted to share what we experienced in the hopes that we can figure out what is going on. Thanks Carl. While most of our clients either manager their own Facebook ads or we do, several of the dealers that I have access to do not, so it doesn't appear to me to be related. I did further digging myself last night and saw that the screen resolution 95% of the time on the influx of Facebook.com referral traffic is 2000x2000, which is indicative of bot traffic. Google views Facebook.com referral traffic as being "quality" and would not be caught by the bot filter. Now the million dollar question, what is Facebook doing with its own bot and why? It's messing up our GA accounts. I just looked at our GA. Same here. did the lead traffic spike as a result? Also did the bounce rate increase as well? No, bots aren't sophisticated enough to be programmed to submit forms. Yes, bounce rates increased rather significantly across the board - from Facebook.com traffic and overall website traffic. However the amount of the increase is dependant on how large of a volume the dealership site traffic receives. Martin Saavedra JR and John Goll like this.